A busy weekend for the stable kicks off at Cranbourne on Friday night with two nice horses contesting the 2080m maiden - Simply Explosive and Sun Holiday. Confident that a rise in distance will suit Simply Explosive, we are looking for an improved performance by the son of Pins. "He was a bit disappointing last start," Michael Moroney conceded, "but the 2080m should suit and whilst it will be his first exposure to wet ground he is bred to handle it - most of the Pins breed like it and he is out of a Zabeel mare." "It looks an even sort of race and we are hopeful of a good run." High Chaparral gelding Sun Holiday is bred to appreciate the rise in distance and Moroney is looking for an improved performance from the gelding who worked hard at his most recent outing over 1850m. "He had to be used up in a race run at a hot pace but he showed glimpses of the ability he has shown at home," said Moroney. We have just the one runner at Caulfield on Saturday, Devonshire Duke due to take his place in the Charter Lawyers Plate over 1600m. Drawn nicely in barrier five for Brandon Stockdale, the six-year-old comes in well after that apprentice's claim and any sting out of the ground will help him. "He has been a terrific horse for his owners but he is just starting to have a few issues with his feet. Hopefully we have got him right - on his best form he is the one to beat." At Kembla Grange we race The Bunsta in the Vince Thomas Memorial Maiden and we are looking forward to seeing how the chestnut fares this time in. "He has drawn the outside gate so he will need a bit of luck but he won a trial nicely and he has come up a long way stronger this preparation." "He should not stay a maiden for long and whilst he will be better over a bit longer he does have a fair bit of speed for a Pentire." Feature racing heads to Morphettville on Saturday and we are saddling up three nice chances kicking off with Zazparella in the Listed Port Adelaide Cup. 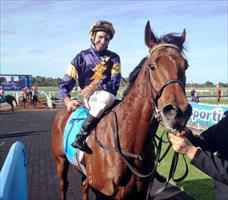 A game last start second at Warrnambool, Zazparella has progressed nicely since. "We have been really happy with her and her last run was very good - she was caught wide and did a fair bit of work but she just kept soldiering on." "She should get a softer run from barrier four this time and hopefully she can earn some much deserved black type." Saint Or Sinner "comes off a bit of a disappointing run" leading into the Gr.3 R.A Lee Stakes but he strips hard fit fourth up and has "been working well." "He looks suited back to the mile and he should run a much better race," Moroney said, noting that the five-year-old is already a Morphettville winner. The $500,000 Group One Goodwood Handicap is the big race of the day and we are excited about the prospects of the lightly raced and promising four-year-old Yesterday's Songs. Catching the eye with a strong late finish second up in the Gr.3 D.C McKay Stakes, Yesterday's Songs has impressed us since. "He was a month between runs last time and he has improved. Of course Group One races are always hard to win but he is very well in himself and he is a talented horse." We head to Queensland with our other Saturday runner, Merion lining up in the Gr.3 Sunshine Coast Guineas. "He has drawn out a bit wide but it does look the right race for him." "He has freshened up nicely for the drop back to the mile and he is suited down in class." Plus he has the services of Damian Browne - "he knows the track and he is riding in great form," Moroney said.